The planet is sick--and getting sicker. Anyone who doesn’t believe this doesn’t get out much. As a biologist, veteran National Park Ranger, life-long outdoorsman and world traveler--I know this to be true--and it pains me. We all contribute to earth’s illness by in one way or another impacting the biosphere’s ability to sustain itself. Travel is no exception. I therefore make a concerted effort to reduce my overall ecological footprint, knowing there's always more to be done. Motorcycles, by and large, have less environmental impact than most other modes of petroleum-based transportation. Motorcycles require less raw materials and energy to produce and fewer resources to transport and operate. Though still a consumer of non-renewable fossil fuel, the BMW F650GS is one of the most energy-efficient, mass-produced vehicles ever made. Unloaded, it achieves 72 mpg. Fully-loaded, and traveling over mixed terrain as I do, it still bests the Toyota Prius hybrid’s 55 mpg (my other vehicle) with a consistent 60 mpg*. While imperfect, it’s far better than traveling by SUV or jet. 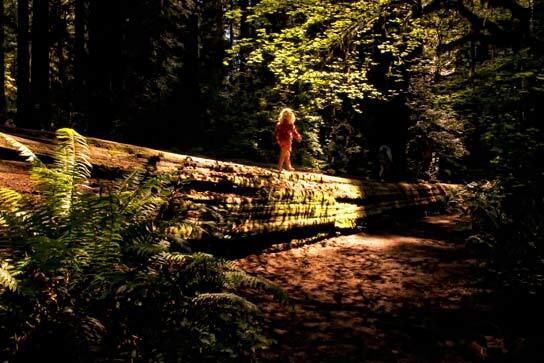 A barefooted pixie patrols the redwood forest. On the road, as at home, I work hard to minimize the amount of trash I produce. Paper, glass, plastic bottles, cans, cardboard, batteries and spent electronics are dropped at recycling stations. Food scraps are composted. Biodegradable soaps are used for bathing and cooking, never in direct contact with natural water sources like lakes and streams. Photography is digital, so no film or chemicals are required. Walking and mass-transit are employed whenever they make more sense than riding. Local entrepreneurs, rather than multi-national chain stores, are sought out and supported through the direct purchase of fuel, supplies, food and Internet access. My family lives in a low-embodied-energy, solar house that I designed and built myself. In spite of our severe Rocky Mountain winters, all of our energy for heating water and space comes from the sun, and the small amount of electricity we consume comes from renewable sources--mostly wind. Think about it. Each of us can reduce our environmental impact and help the planet thrive. It's not difficult--we simply must care enough to act. *This only makes sense when comparing apples to apples: 1-person traveling on a motorcycle versus 1-person traveling in a Prius. The Prius seats 5 whereas motorcycles seat 2, so if I was traveling in a group larger than 2, the per person energy efficiency would be greater in a Prius--and even greater in a bus. Everything has a cost.